Scientist, technicians, animal care attendants and veterinarians all have different roles to play in explaining how and why animals are ethically used to advance scientific discoveries and improve therapeutic treatments of illness. Speaking of Research committee member Michael Brunt was asked to speak to laboratory animal veterinarians and LA veterinary residents from Canada and northeastern USA about the role of their profession in public outreach. 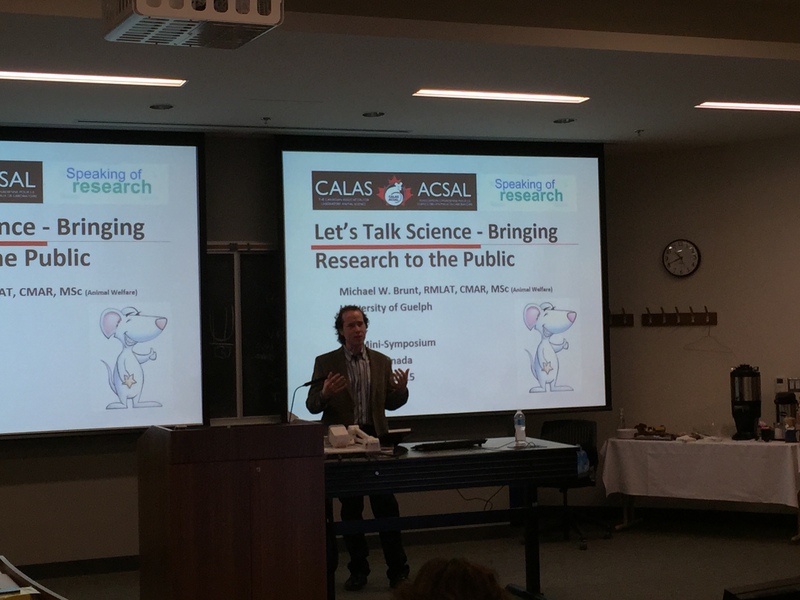 The Mini-Laboratory Animal Symposium was hosted by the Ontario Veterinary College at the University of Guelph. While scientists are the most appropriate group to explain the importance and relevance of their research, veterinarians are likewise the most appropriate group to explain to the public the aspects of medical care, husbandry and welfare of these animals. Pictures accessed through Freedom of Information requests or “under cover” videos are frequently taken out of context and presented in a way that misrepresents the accuracy of image to the public (here, here, here). Veterinarians have a vital role to explain the medical procedures depicted in many of these images. Many of these procedures, like TB testing, are part of a routine clinical care and diagnostic testing that ensures the health and welfare of the animals in their care. It is imperative that misinformation be corrected to ensure that the public has an accurate understanding of what is occurring with animals used in science. All professionals working in this field have a role to play to bring research to the public. Posted on March 13, 2015 August 24, 2016 by EditorPosted in News, Outreach News, SR NewsTagged CALAS, Michael Brunt, outreach. to aid in your discussion. Thanks for the information. I think it’s awesome that veterinarians bring research to the public. I want to know that my pet is well taken care of, and the best way to do that would be to find a veterinarian that does that. Do you have any other tips for me?